I like cats better than I like most people. So it's no surprise I really like Puss in Boots from the Shrek movies...and that I was really excited to introduce Hannah to him in TV form. Hannah still can't sit long enough to watch a full-length movie (probably a good thing) but a 23 minute show she can handle. And as much as I love the five episodes of All Hail King Julien, I was getting ready for something new from Netflix Original/DreamWorks to grace our screens. 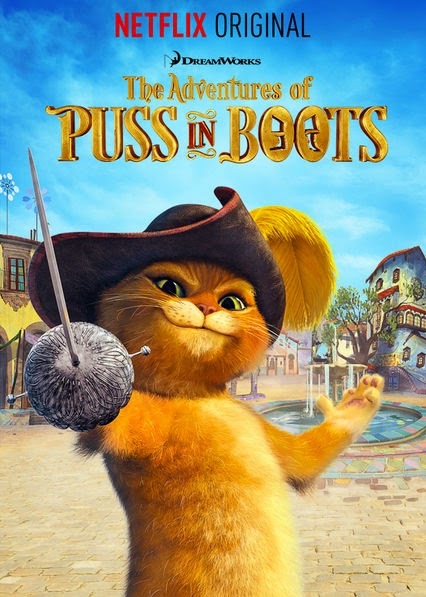 The Adventures of Puss in Boots allow viewers to follow Puss on an misadventure - where he stumbles upon a town, San Lorenzo, and through his own greediness pretty much backs himself into a corner, becoming the town's defender. There are many, many unique characters in this town - especially the children who live at the orphanage, which of course, is shaped like a shoe. Your kids will love the children's personalities. You will love the high brow jokes that your kids won't quite understand. Of course, there is still the awesomeness that is a cat fighting off hooligans with a sword. During one fight, a thief tries to distract Puss with a string. At first he falls for it, but then uses the string to tie up the thief, winning the fight. And don't worry - he still uses his "big eyes thing" to get out of trouble, just as he does in the Shrek movies. And in case you're wondering why Dulcinea - the sweet grey cat who teaches at the orphanage - voice is so familiar, she's voiced by Jayma Mays of Glee fame (you can also stream Glee on Netflix). Just like King Julien, we can't wait for more episodes! What are your favourite shows or movies based on books? Disclosure: I am part of the Netflix #StreamTeam. As always, opinions on this blog are my own. New Year, New Episodes from Disney Junior Canada!